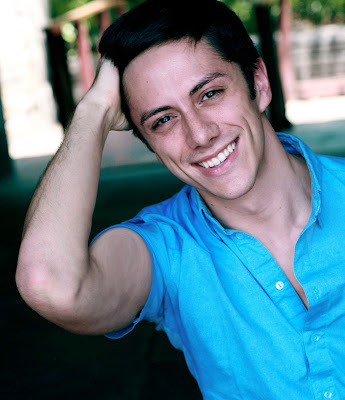 Select Credits: Currently a member of the New York Gilbert and Sullivan Players and also currently starring in Off-Broadway's Naked Boys Singing! Off-Broadway: Little House on the Ferry (Randall, American Theatre of Actors), The Yeomen of the Guard (Headsman, NY City Center), The Mikado (Ensemble, NY City Center); 8Minute Musicals (NYMF 2011); Regional: Christmastime! (with Debbie Reyolds and Sandi Patty, Palace Theatre); Recent concert venues include Lincoln Center, Joe's Pub, The Library of Congress, and Carnegie Hall (four times!). Why theater? : Get ready for this doozy: When I was a kid, I had a favorite game that I would play whenever my family would go somewhere in public; I called it "Homeless Boy." (This may give a little insight as to how kooky I can be...) In order to play "Homeless Boy," I would run ahead of my family on our outings, perch myself in an inconspicuous place, and pretend to be homeless, hungry, and slightly moronic. The members of my family were always willing participants in the game, introducing themselves to the lost boy, and always inviting him to join them on their activities. We would continue the charade throughout the day, convincing park visitors, movie-goers, and restaurant staff that my family did in fact encounter a lone boy and take him under their wing (...told you I was kooky.). When I first began to discover the magic of theater, I couldn't believe that there was actually an outlet for the crazy things that went on inside my head like "Homeless Boy." The more I nurtured these creative juices, the more I began to understand that there are places in this insane theatrical universe for someone like me. And now, in the words of Glenda the Good, I couldn't be happier. Tell us about Boys Will Be Boys: A full production of NYMF 2013, Boys Will Be Boys follows five friends who join forces to produce a "FUN-raiser," a cabaret filled with hilarious musical numbers, incredible singing and dancing, and bingo (we can't forget the bingo!). A musical revue by Joe Miloscia and Kenneth Kacmar, BOYS has had quite a successful life before this year's New York Musical Theatre Festival, garnering critical acclaim from its LA, San Francisco, and New York incarnations. (And with past cast members including stars like Cheyenne Jackson, we have some pretty big shoes to fill!) I'm proud to present this show alongside fellow cast members Courtney Cowart, Jeremy Pasha, Ryan Speakman, and Rance Wright, with director Joe Barros, associate director Katie Pettit, fabulous musical director Alex LeFevre, and our lovely stage manager Mackenzie Meeks. What is it like being a part of Boys Will Be Boys? : The cast, crew, and material are so insanely fun to work with, that I'm pretty sure we could score a reality show on either E! or LOGO. Watch out, Honey Boo Boo! What kind of theater speaks to you? What or who inspires you as an artist? : My biggest passion is musical theatre. When it comes to singing, I come from a very classical background, so I immediately recognize and appreciate musicianship on stage. Nothing inspires me quite like a full, sweeping orchestra supporting a robust voice. What’s your favorite showtune? : Does "Otto Titsling" from the movie "Beaches" count? If you could work with anyone you’ve yet to work with, who would it be? : I would give my firstborn child to share the stage with Renee Fleming. I once broke into her dressing room at La Scala in Milan, and have been completely smitten with her ever since. Who would play you in a movie about yourself and what would it be called? : I think a young Robert Downey Jr. (reference his colorful character in "Wonder Boys") would make a stellar Seph Stanek. The movie would be called 'Completely ObSephed". What show have you recommended to your friends? : If you haven't seen Sleep No More, GO SEE IT NOW! It's one of those experiences that stays with you long after you leave the venue. I saw it two summers ago and still can't get it off my mind. What’s your biggest guilty pleasure? : I'm weirdly obsessed with my fish tank. What’s up next? : I'm looking forward to NYGASP's upcoming New York season and am especially excited about returning to Greenville, South Carolina, in February of 2014 for another home concert! I've got a few other projects in the works, so stay tuned to www.SephStanek.com for updates!